This control panel provides cockpit control and visual status of the Artex ELT110-B Emergency Locator Transmitter (ELT). It provides an interface to aircraft features associated with the ELT system. This control panel provides a visual indication of a failure in the Ground Proximity Warning (GPW) system and the Wind Shear Warning system. The unit also provides a means for inhibiting Mode 4 warnings. This control panel provides a means for selecting transmission on one of five communication radios, the service interphone, or the PA system. Also provided are separate select/volume controls for the five communications transceivers, two interphone systems, eight navigational receivers, two ADFs, and one Marker Beacon receiver. This control panel provides a means for remote tuning of one ARINC 546 COMM transceiver, two ARINC 547 NAV receivers and one ARINC 521D DME receiver. The unit is capable of tuning COMM frequencies of 118.000 to 136.975 MHz in 25 KHz steps and NAV frequencies of 108.000 to 117.950 MHz in 50 KHz steps. 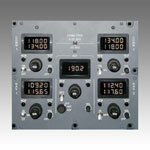 In addition, the Control Panel provides a DME resistive bridge output paired to the NAV frequencies. This control panel replaces the 1U434-001 mechanical frequency control in those Citations upgrading their communications transceivers to Collins VHF 21C, 21D, 22C, and 22D models. The electronics provide enhanced functionality such as frequency pre-selection and 10 non-volatile memories to store up to 10 communications frequencies or navigation waypoints. These control panels are pin-for-pin electronic replacements for the 1U434-001 mechanical frequency selector. Internal memories with one-button store and recall allow storage of waypoints and pre-selected frequencies. This control panel replaces the 1U619-001 frequency selector in those Citations upgrading to transponders with Mode-S Elementary Surveillance Functionality. The transponder function in the 1U619-001 is superseded by an ADF in the 1U661-001. Each module contains ten non-volatile memories to store both nav waypoints and comm frequencies for easy recall. These control panels replace the 1U619-002 / -003 frequency selectors in those Citations upgrading to Mode-S transponders with optional TCAS. The transponder function in the 1U619-002 / -003 is superseded by an ADF in the 1U661-002 / -003. To simplify navigation and communications chores, up to ten memories per module provide convenient storage of pre-selected values.